The Branded Content Barometer: the best Christmas ads of 2017 you haven’t seen! In this follow on feature from last week’s 2017 Christmas Ads review, we take a look at three more Christmas Ads from around the world that are not shown during every ad break, and you may never have heard of! Read on to see how we assess the reasons behind their social performance. Our rating system scores each video across five categories (awarding a maximum of 20% for each category): originality; on brand; creativity; craft; and shareability. The sum of all five scores produces a rating out of 100%. Air New Zealand has really taken the puss [sic] out of their accent in this year’s Christmas commercial. It’s hard not to laugh out loud at this hilarious clip as Santa and his head elf painfully struggle to decipher the New Zealand accents of young Kiwis and fulfil their Christmas wishes. The unique pronunciation has Father Claus enlisting his worker elves to produce among other things: a ‘biscuit ball’ for ‘Bin’ (a basketball for Ben), and a ‘puggy-bank’ for ‘Tum’ (a piggy-bank for Tim). After a fed-up elf spits the dummy with a colourful outburst, the Air Zealand pixies magically save the day after a convoluted explanation of the intricacies of their accent. The airline is no stranger to hilarious video campaigns that have gone viral. They’ve released a host of brilliant videos, but their 2014 air safety video entitled: ‘The Most Epic Safety Video Ever Made’ lives up to its name and has an incredible 18m views so far. It’s always great to see brands that don’t take themselves too seriously, and the current Air New Zealand video is another winning piece of content for this holiday season. There’s no doubt that the half a million views will steadily grow, leading up to and beyond Christmas. In true Air New Zealand style, remember to have a Mirry Christmus! The adorable innocence of children is what inspires a French supermarket chain’s Christmas commercial this year. The story follows the turmoil leading up to Christmas of a young boy who discovers Santa’s unhealthy secret and realises that he is too big to fit down the chimney, but what to do? The boy enlists the assistance of his sister who quickly becomes a resourceful little helper elf. They utilise their trips to lntermarché to fill their shopping cart with an appetising collection of fresh vegetables. They create soups, salads and other healthy meals in the hope of shrinking Father Christmas’ waistline before his Christmas Eve gift-giving adventure. The feel-good clip is enhanced by the charming soundtrack of Henri Salvador’s, ‘J’ai tant rêvé’. We definitely need more commercials like this, encouraging children to eat healthier in a world of fast-food, digital addictions and clogged arteries. Christmas Day finally arrives and the young boy is overjoyed to see presents under the tree (Santa has clearly cut some pesky pounds), but most importantly he runs to give his sister a huge hug. After all, the meaning of Christmas is togetherness. 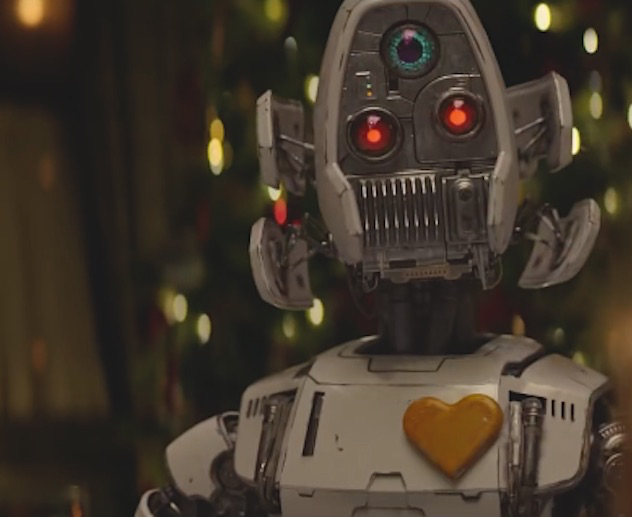 German supermarket chain leader Edeka have blown us away with their dystopian world turned Christmas feel-good commercial. The production value of this 4-minute short film is exquisite; it feels like a blend between ‘Terminator’ and ’Wall-E’. The touching tale follows a quirky robot who tears away from his post to discover the magic of Christmas in an abandoned mall. While trying to recreate the lost world of the humans who have vanished from the city due to an apparent evacuation, our rebellious robot realises that he may find the runaways in the forest. He sets out on a quest through treacherous terrain to finally chance upon a log cabin where he is warmly welcomed by the inhabiting German family. It just so happens that they had done a big shop at Edeka right before the evacuation, and the food has lasted all that time! Lucky for all of those involved, because they enjoyed a hearty feast that evening. The clip has over 3.5m views so far, which is a strong testament to the value of creating epic brand videos, rather than the typical everyday commercial. Edeka has been known to throw everything including the kitchen sink into their epic advertisements, having released a touching tale earlier in 2017 of a boy who learns to fly by eating berries (from Edeka of course). We love to see true creative art behind commercials, and Edeka continue to deliver. We can’t wait to see what adventure is next.